Gmail Resigned Everything You Need To Know! 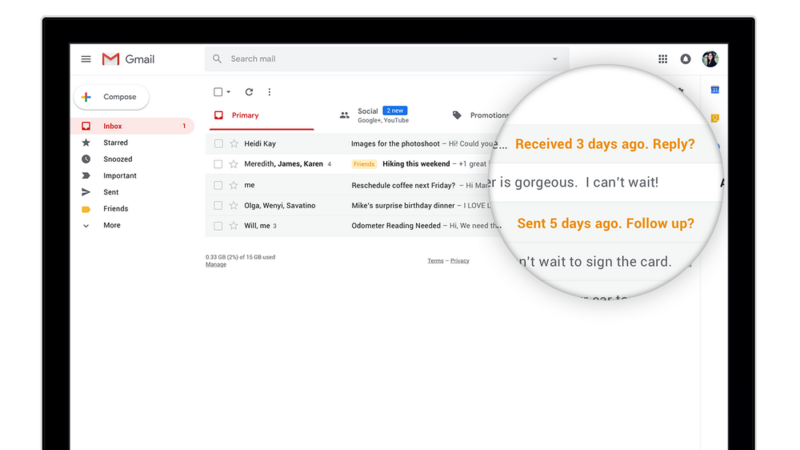 After years of having the same look and feel, Google finally gave Gmail, arguably the most popular email provider a major redesign and feature overhaul. The New Gmail is Here! After years of having the same look and feel, Google finally gave Gmail, arguably the most popular email provider a major redesign and feature overhaul. This new design follows along with Google’s Material design philosophy, that is highly loved by its users on stock android. Fear not, there is not much of a learning curve here, and if you are used to the old school Gmail, you can easily revert back to it. Despite the overhaul, the new look still maintains the familiar layout that we’re all used to with folders and contacts on the left, and emails front and center, right where they should be. We will be highlighting the biggest new features below, with detailed examples for you, before you try it yourself. These new changes appear primarily on the web version of the email client. If you haven’t received it yet, but want to give it a try, click the “Gear” icon in your Gmail inbox (located at the top right of the screen) and select “Try the new Gmail.” As with most Google’s rollouts, they chose to roll out this new design in stages, so it might take some time for you to get it. You can try it on your personal account if you can’t access it via your work/academic Gmail account, as this new redesign needs to be enabled by your administrator. Holding your mouse cursor over an email gives you quick actions like archive, delete, mark as unread or a new feature called Snooze. The snooze feature has been a part of Google’s other email client inbox by Google and has made its way into Gmail. The new Snooze feature is essentially the same thing as the snooze button for your alarm clock, it hides the highlighted email so you won’t be bothered by it until the desired time and date, and it magically appears and takes back it’s said spot on your mail. Additionally, there is a snooze menu on the left side below the compose button to keep track of all your snoozed emails. Also, there is a new-handyRSVP feature in the hover menu for applicable emails so you can give them a quick reply. The Hover Menu also extends to contacts too, with specific buttons for video calling, messaging (on Google Hangouts) and scheduling events available from the pop-up. I’m pretty sure you might get this overwhelming feeling, when you receive attachments from an unknown person, to ensure you don’t fall into the phishing trap, Google has put some efforts into making risky emails pretty easy not to miss. Potentially risky emails are now flagged with bigger and bolder warnings. New Warning are hard to miss! One of the most noticeable changes is how, this new redesign handles file attachments, sent over to you. users no longer need to open an email to view and download attachments. As long as you are using the default display view, there is little icon indicator, showing the type of file that you received along with a clickable preview to view and download the file as you please. For many users out there, Gmail is more than an email client, it’s a service that helps them stay at the top of their productive game, keeping this in mind Google made app integrations a new thing in the new Gmail. By default, Google Calendar, Google Keep, and the new Google Tasks App are enabled and many other available on request including the like of Trello, Asana Streak-CRM and many more. Variety of awesome 3rd party service integration. This is a huge quality of life upgrade, as you don’t need to open a separate tab and check in with your calendar when you reply to an important email. Or just copy and paste entire, notes from Google Keep. All of these items are now displayed in a bar on the right-hand-side of your inbox for quick access, so you can easily create tasks and events based on your emails. The new Tasks app even includes a drag and drop interface letting you move emails directly into the Task interface. Smart Replies are a smart way of saving a lot of time. Yes, that’s not it, there are still features in development, and in the coming weeks Google will them roll them out to the general public. These include AI and Machine learning features that Google loves to try out. Google says will “proactively remind you to follow up or respond to messages.” If a few days have gone by without any interaction on an email, and Google’s algorithms identify it might be a good idea, you’ll see some text in the email list view to warn you. Seems like a handy little feature for those with cluttered inboxes. The new nudging features help you stay productive. Imagine Snapchat, but for email instead of images and videos, that’s one way of describing confidential mode. This mode lets you set a self-destruct-like stamping an expiry date on your emails, so they’ll disappear from the recipient’s inbox at a certain time. These features would be of prime importance for people handling sensitive business over email like corporate executives. Even better, these email can be sent to a recipient, along with a unique passcode sent as an SMS on their phone, to access this confidential email. The downside is that you need the recipient’s phone number in order to do so. This is to ensure sensitive emails do not fall into the wrong hands. Further, a set of controls known as Information Rights Management have also been included as part of Gmail’s new privacy features. This can let you remove certain privileges from emails you send, such as printing them, forwarding them, and copying them. There are other features in development like a new Offline mode, that lets users search, respond, delete and archive up to 90 days of emails even when the devices are offline. And other helpful features like, Assistive unsubscribe and high-priority notifications for those irritating email subscription you receive from a site that you browsed years ago. If you are feeling up to it, try your hand at these new features, you are most likely going to love them. I have and I am already loving it. Look out for all of these features in the new Gmail and shout out any great additions we’ve missed in the comments below.